Two coronal mass ejections resulted in a KP8-9 solar storm. In non-technical terms, the northern lights were easily visible as far South as Estonia and England. 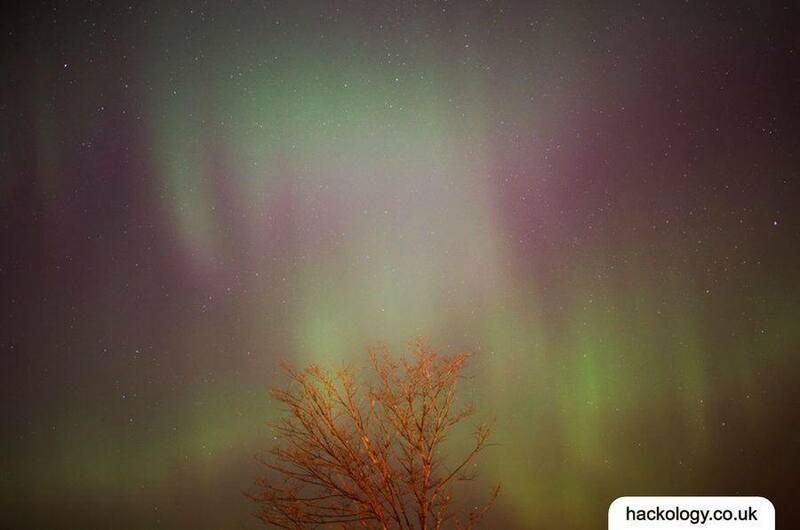 I wish that this had happened at the weekend so I could view it from rural Estonia (no light pollution). It was still pretty amazing, even from the city! 10 minutes of footage to create a 7 second video – I wish I’d stayed out longer! This timelapse was composed of ~100 five-second exposures, spaced six seconds apart. In order to achieve this “high” frame rate (10/minute) with the very faint aurora, I shot at high ISO. To correct for the high ambient light (due to the city), I made heavy use of the correction curves in RawTherapee. The temporal chroma-noise removal provided by the hqdn3d filter in ffmpeg basically made the difference between this timelapse being pretty and just being a bunch of purple/green random pixels. This completely annihilates temporal chroma noise. It is pretty aggressive towards spatial chroma noise too. It also attacks temporal luma noise, although not so much. The aggressive reduction in chroma noise (in both domains) is justified by the sky being mostly greyscale – white stars on black background, while the lights themselves are very smooth. The slight reduction in luma noise is there since the only temporal luma change should be due to the slow movement of stars as Earth rotates, and the slow movement of aurora. Any blurring of the stars caused by the slight reduction in spatial luma noise is recovered by the unsharp mask, since the stars have high contrast. I re-rendered the timelapse in 4k resolution (actual 4096×2160, not the fake 4k that UHD televisions claim). The first video is with noise reduction / unsharp mask, and the second video is just the raw timelapse with no post-processing. These require a powerful computer with a high-resolution display and fast internet connection (or give time for buffering). Phones and tablets will not be sufficient to play these videos. Browsers from Apple and Microsoft also lack sufficient codec support for decent quality 4k video. I tested these in Chrome and Firefox on a 2.2GHz Intel Ivy Bridge i7 with AMD Radon 8750M. This entry was posted in Eastern Europe, Estonia, Nature, Photography, Timelapse, Travel and tagged aurora borealis, estonia, northern lights, tallinn on March 18, 2015 by Mark K Cowan. This entry was posted in Estonia, Humour, Photography, Travel and tagged estonia, kaiu, kaiu vald, kartul, potato picking, timelapse, tolla on September 17, 2014 by Mark K Cowan.